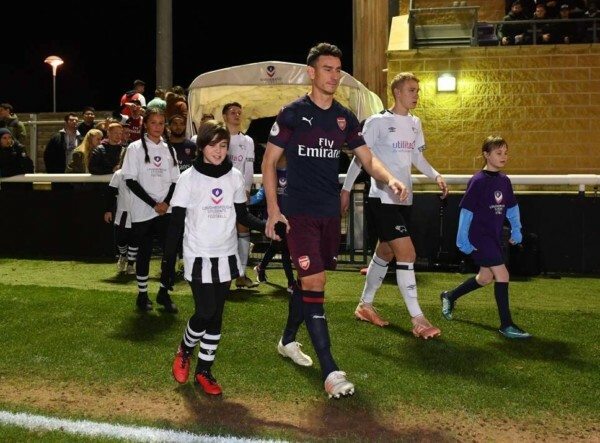 The best news of yesterday has to be the return of Koscielny to the football pitch after he played for the Under-23s last night as they played Derby. It was a hammering for the team but the fact he’s (unless we’re told differently) come out of the game unscathed will be a big boost for Emery. Koscielny has a couple of years on his current contract and there’s too much chatter online about him being finished for my liking. There’s also too much talk about him having lost pace, being erratic, probably not cut out for top flight football any more. Balderdash if you ask me. He’s a senior pro who will add value to our squad and at a time in which we’ve seen a general improving in most of our centre halves compared to last season (individually I mean, because as a collective we still look ropey as hell), I don’t see why Koscielny can’t be part of that improvement process. So let’s just hope he gets another game or two – maybe a sub appearance and then when we play Qarabag at home in a couple of week’s time – do we can start to look at our central defensive options and see which pairing works best. Or a three perhaps, which is what we saw on Sunday, although I don’t think it worked perfectly well. I mentioned it yesterday but certainly in the first half Bournemouth pumped a lot of balls in to the channels and had they not changed tactics in the first half I suspect we’d have encountered more trouble than we did. Holding has done well this season but it’s no secret that he’s not the most mobile defender and I think he struggled a bit at fines playing as either a left-sided centre half or auxiliary left back. Somebody like Koscielny with his experience would, I think, be better equipped to deal with the way Bournemouth set up as he is a more mobile defender than Holding. On the other side Mustafi is more mobile but his erratic nature was a little scary and always will be. I did notice though that when balls were played in behind Bellerin on Sunday it felt like Sokratis and Mustafi were changing roles. One ball into the channel would see Sokratis go with the man (and on a couple of occasions wrestle him down) whereas the next ball would see Mustafi track the player. Holding didn’t seem to get that same coverage and that’s why I wonder whether a more experienced man like Koscielny would have been better suited. It’s a moot point because he’s obviously been injured up until this point, but I do feel like his arrival gives Emery more options in terms of the type of defender he wants to play against an opponent. The re-introduction of Koscielny allows him to shuffle his deck more and with Emery clearly showing he wants to change things on a game-by-game basis that can only be a good thing. We just have to hope that Koscielny can stay fit because with Emery you’re going to get game time as he tries different things. That’s also why I was so surprised on the hoo-ha the media made over Mesut not playing. Surely most of these journos are those that are detailed to watch Arsenal for most of the season and with that being the case surely they will have known that writing about the fact he never got off the bench isn’t really even a story. I guess for those desperate to make a story out of a non-story in the vain hope of a few more clicks it is worth a punt, but the reality is that Emery changed the composition and structure of the team and tried it without Özil. I suspect given the turgid performance of Mkhitaryan that Özil will be back in for Sunday’s North London Derby, but still to me I don’t mind Emery moving things around a bit. He’ll probably do the same on Thursday and again I don’t really have a problem with that. In fact given the NLD it’s probably the best thing we could do to avoid any serious injury. I saw something yesterday which said it’s going to be -13 degrees. That’s twanged muscular injury territory so I’m hoping there isn’t a first teamer in sight. Let’s see Pleggy start, let’s have Willock, Maitland-Niles, Smith-Rowe, Nketiah all get game time alongside Elneny, Cech, Lichtsteiner et al. Whilst the Totts are playing a full strength team against Inter Milan at home we have an opportunity to completely rest players and be fresher than them for Sunday so I say we should 100% do it. I’m sure the boss will be wheeled out in front of the press, probably when in Ukraine, probably with those hand warmer things you put in the microwave strapped to his face. But it will be interesting before then to see how many first team players board the plane today. I’m assuming they’ll be heading out this morning because by the sounds of it there’s one hell of a schlep in front of them by air, sea, land, bus, donkey, etc, just to get to the ground. And until then and until we know what the situation is with the squad, we wait patiently for the next game, as well as the hope of extending the unbeaten run to 18.